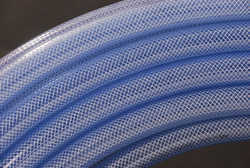 » PVC Flexible reinforced hose with textile Yarn. Enriched with vast industry experience we have been committed in providing fine quality R6 Single Yarn Braided Hose to our esteemed clients at nominal price. Sizes 5 mm to 65 mm. Industrial air and water hoses, welding hoses, thermoplastic hoses. Authorised dealers for samson and cosmoflex braided hoses. So as to accomplish high level of customer trust, we are keenly involved in offering PVC Braided Hose Pipe. We are providing nylon braided hose pipe. Samson Pipes are known for their integrated PVC braided structure that makes them flexible and durable, and a better alternative as compared to rubber hoses and pipes. Now, you can buy Samson Pipes online, from us. We stock all standard sizes and types of Samson Pipes. Nylon braided hose by SAMSON allows gases and liquids to pas through it easily . The nylon used is of high quality which is highly resistant to any damages occurring by temperature, pressure, rodent bites, crushing and kinking etc. We have a complete range of flexible supply hoses for wash basin faucets, sink faucets, health faucets and shower hoses. All hoses are produced on imported German machines. Hoses are circumferentially crimped to achieve high operating and burst pressure.